Conveniently located in the beautiful rolling hills of historic Gettysburg, Pennsylvania, Needle & Thread is the quintessential fabric and sewing store as well as your headquarters for historically accurate fabrics, trims, lace, needlework tools, notions and sewing supplies. Our merge with Wooded Hamlet Designs brings over 50 combined years of knowledge and expertise in historical fashion and textile arts to your disposal. Find the perfect fabric at the Needle & Thread store, then add details with Wooded Hamlet Designs products, either in the store or here at the woodedhamlet.com web site. Take a gander at all we have to offer: Luxurious pure silk ribbons in wide widths, cotton twill tapes and linen embellishment. Reenactors of all eras will love the selection of worsted wool regimental trim. Check out our buttons and clasps in brass and German silver -- handmade and exclusive to our store. We carry hard-to-find, true metallic braid made of real metal fiber -- not the artificial looking replacement one sees too often. Check out our wonderful selection of laces for that one of a kind collar. Cords made from wool, mohair and cotton that have previously been so elusive to shop for are now available from our unique selection. 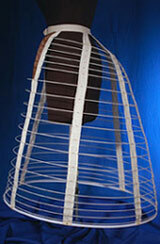 Ladies, now delight in the availability of authentic Caged Crinoline Kits, another one of our exclusive offeings. Don't forget the notions! Check out our selection of English sewing needles. More surprises await in the needlework tools section for those searching for unique gifts. Whether you decide to stop by our retail store in Gettysburg, Pennsylvania, or simply call in your order form this website, Needle & Thread and Wooded Hamlet Designs will quickly become your favorite place for hard to find fabrics, trims and sewing supplies. Click on Photo to see this exciting new product!